August 7, 2016 July 12, 2018 - 64 Comments. “The true gourmet, like the true artist, is one of the unhappiest creatures existent. By definition, gourmets are connoisseurs, taking food more seriously than most and embodying the axiom “live to eat rather than eat to live.” True gourmets, as Ludwig Bemelmans would define them, appreciate food of the highest quality, exalting only in the rarefied experiences–those which require the most discerning palates and noses to cognize subtle nuances in complex and sophisticated flavors and aromas. Bemelmans, himself an internationally known gourmet, posited that the true gourmet will find joy only in tasting, smelling and appreciating perfection, not in its pursuit. I’ve known several true gourmets fitting Bemelmans definition. Most of them are insufferable and condescending. Though endowed with refined palates cultivated by years of indulgence in the finest foods and blessed with olfactory senses which would put a German shepherd to shame, they derive no sensuous enjoyment from most culinary experiences. Nothing is quite good enough. Nothing meets their demanding and exacting standards. Dining (they don’t eat) with them is a test in patience as they deride and diminish everything put before them. Perhaps the best example of a Bemelmans’ style gourmet is Anton Ego, the notoriously harsh food critic from the wonderful animated movie Ratatouille. Ego earned the nickname “the grim eater” for his impossibly difficult to please, pedantic palate. His ironic proclamation, “I don’t like food; I love food.” belied his joyless, funerary approach to dining. In 1984, British authors Ann Barr and Paul Levy, coined the term “foodie” to describe passionate food-lovers who have enraptured conversations about their food discoveries. As with gourmets, foodies have a passion for high-quality food and they pursue it with zeal. Unlike gourmets, however, foodies are interested in all kinds of foods–up to and including pedestrian, everyday foods such as donuts and potato chips, as long as they are of the highest quality. Foodies find joy in the pursuit and are generally a lot of fun to break bread with. Over the past two and a half years, none of my faithful readers have provided more solid tips on where to go to find great food than my friend Barbara Trembath who has shared her finds with me not only for Albuquerque, but for Boston, Sacramento, Phoenix and other locations to which I’ve traveled. A seasoned traveler with a sophisticated palate, Barbara exemplifies the term “foodie” in the best sense of the term. She revels in the sensuous enjoyment of a great meal and like me, is hardly monogamous when it comes to eating out. She is constantly on the look-out for the next great dining experience and is finding a lot more of them recently because she moved to Boston in 2012. A great dining experience. That’s one of several things that distinguish a foodie from a Bemelmans style gourmet. Foodies like Barbara relish the holistic experience of dining. They initiate and enjoy the interaction with chefs and wait staff alike, gleaning as much information as possible about their meals. They savor the experience of trying new and different entrees. They engage in the discernment of ingredients, even to the point of trying to figure out how to recreate recipes for those they enjoy most. They talk during their meals…mostly about their meals. Sharing a meal with them–and they do share–is akin to sharing a meal with me. After far too many weeks of failed attempts to break bread together, we finally met at Budai Gourmet Chinese in the Far North Shopping Center. For adventurous foodies, there are few restaurants in New Mexico as accommodating–and as much fun. Barbara had been to Budai several times, predating reviews by both the Albuquerque Journal and the Alibi. I was pleasantly surprised to see she was on a first-name basis with Chef Hsia Fang and his effervescent better half, the pulchritudinous pint-sized hostess Elsa. More impressively, Elsa didn’t try to dissuade them against trying something from the “non-secret” menu (thank you Ari Leveau) as she might people she pegs as “sweet and sour” loving Americans. That’s a sign of respect. That’s a sign she’s earned her stripes by having proven themselves as atypical diners. Being presented with the “other” menu places her in an exclusive class usually reserved for Asian diners who were raised on foods many Americans might consider weird, strange, different…or worse. Budai Gourmet Chinese opened its doors shortly before the dawning of the year 2010. It didn’t take long for savvy Duke City diners to realize Budai was a special restaurant, one for which the appellation “Gourmet Chinese” is appropriate. Budai is named for a small fishing village in Taiwan, the “beautiful island” about 75 miles from mainland China. Neither Hsai nor Elsa are from Budai, but both are inspired by the little village for which they named their restaurant. Hanging on a wall is an intriguing poem from Budai written in sinography, the unique Chinese character writing style. Elsa says the poem loses a lot in translation. On another wall are several photographs taken during a “wrap” party when the filming of a Jackie Chan movie in Albuquerque was completed in 2008. The Fangs got to know Jackie fairly well and broke bread with the acrobatic actor several times during his stay in the Duke City. Chan, as it turns out, is quite a cook himself. It’s doubtful he’s of the caliber of Budai chef Hsai Fang. It’s possible no one in Albuquerque is. The day after my inaugural visit, I craved its incomparable flavors so much I had to visit Budai again. Barbara told me that would happen, that I wouldn’t rest until I’ve tried everything. I’m off to a good start. Perhaps because of the many and varied economic, geographic, ethnic and cultural influences, Budai’s menu is inspired–and not just the not-secret one. The regular menu showcases a variety of dishes and cooking styles from several provinces in China as well as several dishes native to Taiwan and even some influenced by the Japanese who occupied Taiwan for many years. Dishes are categorized into chicken, beef, pork, duck, shrimp, fish, squid, scallop, mussel, tofu and vegetable entrees. A limited–nine small plate treasures–dim sum menu provides tantalizing temptations, several of which might together constitute a meal. Some diners eschew appetizers altogether and substitute a dim sum treasure or two. Though the de rigueur Chinese soups (hot and sour, won ton and egg drop) are available, adventurous diners will see “fish and Goji berry soup” on the menu and read no further. A separate section highlights hearty noodle soups. Organic flowering tea served in a clear glass pot offers a visually stunning alternative to traditional teas. If you’ve never had flowering tea, you’re in for a surprise. Hand-picked premium tea flower buds are actually hand-sewn into rosettes. When steeped in hot water, these rare artisan tea buds slowly blossom into a bouquet of breathtaking shapes. 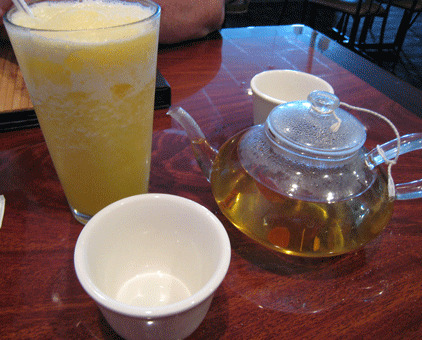 Budai calls these teas “liquid meditation.” At the other extreme is a slush of the day offering in which fresh fruits are mixed with pulverized ice to fashion a refreshing beverage. 23 November 2013: One of the telltale signs of a great dim sum house is high quality dumplings. Though Budai’s dim sum menu has but two featured dumplings, another is available on the “no longer secret” menu. The boiled chive pork dumplings are absolutely not to be missed. Fifteen juicy and meaty (porky?) 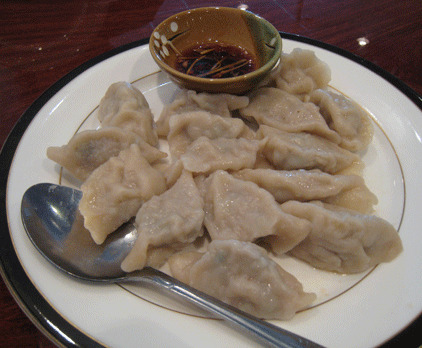 dumplings with a perfect consistency between thin translucent wrapper and fillings have that familiar, comfortable flavor that will remind you of why you fell in love with dumplings in the first place. Immerse them in a light sauce of ginger, garlic, rice wine vinegar, soy sauce and chili and that comfortable flavor becomes intimate with your taste buds. 31 August 2010: The Taiwanese beef noodle soup is an elixir for whatever ails you–a warm, nourishing, soul-warming broth flavored sublimely with star anise, Chinese five star powder and other, more subtle seasonings. Luxuriating in a bowl the size of a small swimming pool are yellow and green onions, thick wheat noodles, shards of Napa cabbage (a very flavorful but drastically underutilized cabbage) and stewed beef. Budai will prepare it to your preferred spice level, taking care to ensure it’s neither too incendiary nor too weak. 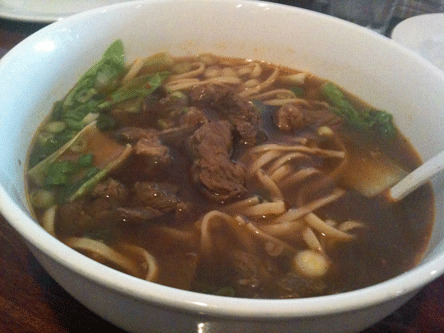 The only beef noodle soup in Albuquerque that’s comparable is the spicy beef stew at Cafe Dalat and May Hong. That places it in rarefied company. 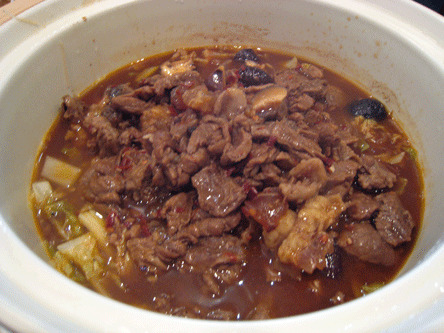 1 September 2010: The beef stew in clay pot is equally enrapturing. Served in a clay tureen is a bounteous stew that will make you long for the cold snap of winter when the stew’s enveloping warmth can mollify any of old man winter’s misery. Basking in a beguiling broth are cellophane noodles fashioned from mung beans, chewy beef tendon the consistency of gummy bears, succulent stewed beef, yellow and green onions, earthy shitake mushroom buttons and a variety of spices which impregnate the stew with flavor. If possible, this stew is even better the second day when those flavors have penetrated even more deeply. 1 September 2010: Elsa delights in offering suggestions, describing each dish’s provenance and composition at great length if you ask–and she does so with a rare alacrity that bespeaks of her love for the cuisine masterfully prepared by her chef husband. Her knowledge of the menu will ensure complementary dishes are served. When my Kim ordered the tea leaves-smoked duck, Elsa diverted me from ordering a beef tongue entree, indicating the beef stew in clay pot would provide a better, more complementary alternative. She was right! 1 September 2010: The tea leaves-smoked duck is magnificent, each meaty morsel of a half duck imbued with a bacon-like smokiness that complements the essential duck flavor. It’s a juicy duck with a perfectly crisp skin and just enough glistening, glorious fat to lend to the textural experience. Thankfully Budai doesn’t serve the duck with a Hoison sauce or with incendiary chili as some Chinese restaurants do. Instead, a very light and subtle rice wine sauce lends just a hint of savory sweetness. Tea leaves-smoked duck is a quintessential Szechuan entree and is generally served in festive and celebratory events–like enjoying a great meal with friends. 31 August 2010: Budai’s orange peel beef is also subtle, a subdued version of a dish Americanized Chinese restaurants tend to overdo with sauces that are usually cloying and redolent with an excess of tangy orange peel. Americanized Chinese restaurants also tend to over-caramelize the beef, leaving it an overly chewy, sweet and sticky mess that tastes very much like candied beef. At Budai the orange peel beef is lightly seasoned with flavors that tease, not overwhelm. The beef is breaded to a whisper-thin consistency then fried along with slices of orange peel and dried chilis. It’s a very nice version of a very popular dish. 31 August 2010: Budai’s sugar vinegar short ribs belie the named ingredients, being neither overly sweet nor vinegary. Both flavors are present, but not in the proportions the name sugar vinegar might hint at. In fact, these ribs are wholly unlike Chinese barbecued ribs which tend to be lacquered with sauce. Instead the sauce is light and delicate, a flavorful sheathing to complement the meaty short ribs which you’ll gnaw with delight. 30 August 2010: During our third visit, Elsa came to our table and excitedly told us Budai had a unique vegetable the Chinese call “hollow heart” because its stems are characteristically hollow. Sometimes called water spinach, Chinese watercress and a host of other names, it’s got nutritional benefits comparable to spinach. Budai’s rendition is prepared the Cantonese way, with fermented tofu which imparts a very nice flavor. The hollow heart is fun to eat though it can be messy because you either cut it or you wrap your fork around it like spaghetti. 31 August 2010: One entry a Bemalmans style gourmet would probably not appreciate in the least is Budai’s Dong Bo pork, a fatty pork stewed for eight hours. This half-lean meat and half-fat pork belly dish has a very interesting texture. The fatty portion is almost gelatinous to the point many would find it off-putting. In concert with the lean meat portion, however, the fatty flavors sing. Though very fatty, the dong po pork isn’t discernibly greasy. It’s very tender, so much so that if you wish to forgo the sensation of fattiness, all you need to extricate succulent meat from fat is a fork. To fully enjoy this dish, have it as the chef intended–and centuries of tradition dictate–intact with glorious fat and meat. 9 June 2012: Diners who might find the texture of the fatty portion of Dong Bo Pork a big off-putting will delight in the Shanghai Ribs with Chinese Vegetables entree. The Shanghai ribs are essentially the lean portion of the Dong Bo Pork in the form of the most delicious, most tender and glorious short ribs you’ll ever have. As with most items on the menu, Chef Hsai Fang takes no shortcuts in preparing this entree, a painstaking process that involves several cooking techniques including flash-frying, baking and grilling. The result is fall-off-the-bone tender short ribs that melt in your mouth. The sauce is complex and delicious with such components as hoisin and light soy, but in such light proportions as to be a challenge to discern, thereby not being dominated by any flavor profile. The Chinese vegetables bed on which the Shanghai ribs lie will vary depending on what’s in season. One popular choice in Taiwanese cooking is Taiwanese Napa cabbage. Napa cabbage is so important to Taiwan that a sculpture of the vegetable is on display at the National Palace Museum. The name Napa has nothing to do with California’s famous viticulture epicenter, but translates from the Japanese term referring to the leaves of any vegetable. Taiwanese Napa cabbage is crisper than other varieties of Chinese Napa cabbage. It does not wilt under the sauce used on Shanghai Ribs. 30 August 2010: The most passionate foodies don’t think twice about trying something that might inspire fear and loathing in less adventurous diners. During my third visit to Budai, I ordered beef tongue only to find out my friend Barbara had ordered and enjoyed it thoroughly the night before (a little cliche about great minds might be appropriate here). Having had lengua (Spanish for tongue) in various ways and on many occasions, the notion of trying tongue was a no-brainer. Contrary to what one might think, the texture of tongue is not akin to shoe leather nor is it comparable to menudo. The tongue is thinly sliced and on the plate resembles several little, oval tongues, none pink. Texture-wise, it might remind you of the sliced sausage adorning some pizzas. It’s not tough, sinewy or chewy in the least. Budai’s tongue recipe calls for grilled jalapenos, green onions, white onions and a soy sauce based sweet sauce invigorated by the jalapeno. This is excellent tongue, so good you might just tell your friends you got some “tongue action” last night. 30 August 2010: Taiwanese pork chops are another Budai specialty prepared in ways you might not see at any other Chinese restaurant in Albuquerque. 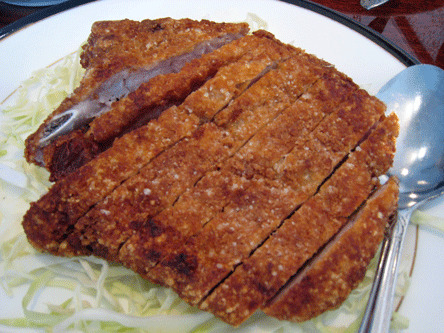 The pork chop is breaded almost Milanesa style, but it’s just an exterior covering for a very tender and juicy pork chop flavored with soy sauce and five spice powder among other seasonings. What makes this pork chop special are its accompaniment–mustard greens and fried rice. The mustard greens have a tangy, almost vinegary flavor with a crunchy texture. The fried rice isn’t made with soy sauce, but is light, fluffy and delicious. 15 December 2010: From Shanghai comes a playfully artistic and playfully named casserole dish called Lion’s Head. Budai’s rendition is somewhat different from the rare (at least in New Mexico) Chinese restaurants which offer this entree. Instead of one gigantic meatball configured by ingredient placement to resemble the head of the king of the beasts complete with a shaggy mane, Chef Hsai serves up several large (by American standards) meatballs. The meatballs are constructed from pork he grinds himself then tops with shredded greens (Chinese cabbage black mushrooms, bamboo shoots) meant to represent the mane. This flavorful melange, redolent with garlic and star anise in a fragrant brown sauce, is prepared and served in a clay vessel as big around as a wading pool. It’s a fabulous entree! 15 December 2010: For sheer fragrance, perhaps the most olfactory-arousing, palate-pleasing dish at Budai is the curry shrimp, equaled only by the rendition proffered at Ming Dynasty. The curry is gravy thick and brackish in color–not quite green and not quite brown, but a combination of both. It has equal pronouncements of savory and sweet though not nearly as sweet as a coconut enriched Thai curry. The vegetables in this curry dish–potatoes, carrots, zucchini, mushrooms are perfectly cooked with the potatoes reminiscent of those you might find in massuman curry. The shrimp are large and absolutely magnificent, a sweet and briny foil to the pungency of the curry. 15 January 2011: In January, 2011, my friend Alfredo Guzman regaled me with tales of his recent visit to California and the terrific Chinese food he ate during his stay all the while lamenting the absence of great Chinese food in Albuquerque. That was akin to throwing down the gauntlet in my direction so I invited my friend to Budai. A whiff of the magical aromas emanating from the kitchen followed by a couple of bites of the chive pork dumplings and the California Chinese restaurants suddenly didn’t measure up any more. The smiles of sheer joy on his face were a testament to yet another convert won over by the greatness that is Budai. 15 January 2011: In between utterances of pure joy, my friend, a native of the Philippines, exclaimed (several times) how our shared entrees elicited flashbacks to the style of food on which he grew up. The flavors triggered happy memories of great meals he hadn’t experienced in years. Fred couldn’t believe a Chinese restaurant in New Mexico would serve pig’s feet with mung bean noodle soup. He couldn’t believe just how good this dish is. The pig’s feet are meaty and delicious with a surprising tenderness. The mung bean noodles, some at least a foot long, are perfectly prepared. The broth, an amazing elixir in a swimming pool sized bowl more than big enough for two, includes bak choy and scallions. 15 January 2011: When we inquired about the three cup chicken dish on the menu, Elsa explained that when she grew up in Taiwan, chicken was a rare delicacy so the family cook found ways to stretch it as far as it would go. One way was by creating a broth made with one cup rice wine, one cup sesame oil and one cup soy sauce along with ginger and basil. The broth was simmered for a long time in an earthenware pot along with chicken. The slow simmering ensures the sauces are absorbed by the chicken. This dish is served in the earthenware pot on which it is prepared. 15 January 2011: Elsa also shared that, courtesy of the three sauces, the dish was extremely salty so it was served with rice to absorb the saltiness and in the process, stretch the dish. Conscious of today’s low sodium lifestyles, Chef Hsia’s version of three cup chicken is far less salty. Elsa informed us that several Filipino customers asked that instead of chicken, catfish be used on the three cup dish. That’s the way we requested it. The three cup catfish was absolutely amazing with the prominent flavors of ginger and basil enveloping us in warmth and deliciousness. It’s one of my new favorite dishes at Budai…along with the pig’s feet and mung bean noodle soup, Dong Bo pork, etc., etc…. 7 May 2011: If you make it a practice to ask Elsa to select your meal, you’ll always be pleasantly surprised. When my friend Ryan Scott, the dynamic host of Break the Chain, walks into Budai, he’ll tell Elsa “I’ve got $25 to spend for lunch” and places himself entirely in her hands. He’s never had the same thing twice and has nothing but praise for everything he’s had. One new favorite he and I shared is an appetizer of lightly marinated and seasoned thinly-sliced beef served on a bed of lettuce. Not quite as thinly sliced as carpaccio and far more generously plated than carpaccio tends to be, this cold-served beef may remind you of high-quality roast beef, but with subtle seasoning that brings out even more of the beef’s natural flavors. 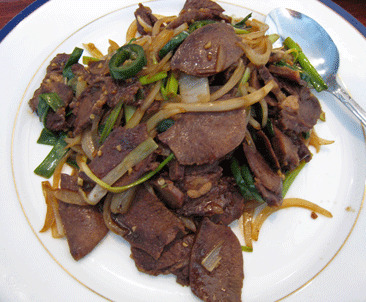 15 May 2011: In recent years, foodies have embraced the holistic potential of every part of an animal, many discovering that offal isn’t awful. Offal, a culinary term referring to the entrails and internal organs of a butchered animal is often considered a delicacy. Budai subscribes to the use of all animal parts, unleashing deliciousness in every part. Take for example beef tendon, which some might dismiss as elastic, sinewy and tough. In the hands of Hsia, tendon is prepared with incendiary chilis, whole peanuts, green onions and lively seasonings that will awaken your taste buds. Thankfully Tsai doesn’t boil the tendon to the point that it’s soft and flavorless. Its texture is honest and its flavor is fulfilling. 15 May 2011: Another greatly underutilized ingredient which in the hands of a master can be quite good is taro, a tuberous root vegetable which, much like a sponge, can absorb the flavor of almost anything with which it’s cooked. Taro is sweet, but not cloying. It’s starchy–much like a parsnip or turnip–and retains its form when cooked. Budai serves a taro and chicken stew that is simply redolent with flavor. The savory qualities of the chicken and the sweetness of the taro coalesce in a thick broth that impregnates the dish with deliciousness. The chicken is not de-boned, a minor inconvenience considering how taste each morsel is. Taro root is perhaps not so much an acquired taste as it is an ingredient you either like immediately or you’ll never like it. On its own, it’ll probably never win any favorite flavor contests, but as a complementary ingredient it melds well, like a good supporting actor. The not-so-secret menu has offered, on occasion, a crispy fried duck layered with taro root paste. Perhaps only vegetarians would find fault with the crispy duck which is succulent and tender, a paragon of poultry perfection. The taro root paste, on the other hand, is starchy and semi-sweet. To me, it’s a nice complement; to my Kim, it’s a nuisance to be scraped off. 23 November 2013: As with many great restaurants, Budai offers a seasonal menu that takes advantage of ingredients which are at their freshest during each of the four seasons. Though winter is not often thought of as a growing season, it’s the time of year in which Chef Hsai prepares soul-warming specialties not available any other time of year. Among the very best of these is a luscious lamb stew wholly unlike the mutton stews so prevalent in New Mexico’s Navajo country. It’s a stew so rich that Hsai dares not serve it any other time of year, so rich that Elsa contends it can give diners a bloody nose if eaten in summer. That sounds like the perfect wintery elixir and it is. The lamb, as tender as can be at under one year of age, is selected personally by Elsa and Hsai from a local rancher. One-inch lamb cubes (bone included) are marinated-brined-stewed for hours in a sauce that includes rehydrated figs, scallions, chilies, star anise, garlic skins, fresh ginger and other seasonings then is served with mung bean noodles, shitake mushrooms and cubes of tofu. The tofu is “honey-combed” thanks to first being frozen then thawed. The tiny holes allow the cubes to absorb the unctuous broth very well. The stew is served in a clay pot nearly the size of a swimming pool. It’s one of the most delicious dishes I’ve had at any Chinese restaurant anywhere, but then I say that about almost everything at Budai. 23 November 2013: When ordering something as large, filling and rich as the lamb stew, Elsa will recommend a “smaller” appetizer such as the five spice and honey lacquered ribs. Smaller in this case means four large meaty, fall-off-the-bone tender ribs instead of say fifteen boiled chive pork dumplings. Lacquered in a rich sauce of five spice powder and honey, the ribs give the appearance of being very sweet, but they’re not anywhere close to the “meat candy” some Chinese restaurants serve. Nor is the meat “disguised” in the sauce. These are so good and so tender you don’t even need teeth to enjoy them. 9 June 2012: There is never a shortage of adventurous surprises on the Budai menu and if you’re an adventurous diner who likes to try new things, you’re bound to find a new favorite every visit. Pity the monogamous diners who eat the very same thing every visit because they’re missing out on the joy of new discoveries. On the other hand, those of us who try new items every visit won’t partake of the type of wondrous deliciousness you can eat every meal. One item I’ll surely miss until it comes back up on my rotation are the Five Flavor Mussels (alternatively you can order Five Flavor Cuttle Fish), New Zealand green-lip mussels in a multi-ingredient, multi-flavored sauce. The base for the sauce is a sweet tomato sauce (you’d be surprised at just how much tomatoes and even ketchup are used in Chinese cuisine) to which is added garlic, ginger, scallions and chili. It hits every note on the flavor scale. 1 May 2014: Jeff Smith (The Frugal Gourmet) posited that “Scallops are expensive, so they should be treated with some class. But then, I suppose that every creature that gives his life for our table should be treated with class.” Imbued with a mildly sweet and delicate flavor and a tender, but not mushy texture, scallops are often maltreated at restaurants which deploy sauces which obfuscate their natural flavor. That has long been my opinion of restaurants which cover scallops in marmalade-like orange sauce so cloying there is little natural citrus influence discernible. My friend and fellow gastronome Hannah Walraven of Once Again We Have Eaten Well raves so effusively about the crispy orange peel scallops at Budai that trying them was inevitable. If anything, Hannah sold this entree short. It is simply fabulous! Served in a ceramic seashell, the scallops are lightly battered and covered in a reduced orange sauce with ginger, Szechuan chiles and plenty of crisp yet chewy orange peel with a candied texture and flavor. The sauce doesn’t detract from the flavor of the large scallops and is wholly unlike the syrupy sauce so many other restaurants serve. 2 May 2014: With almost every Chinese entree you can name, there’s a version other restaurants serve then there’s Budai’s version. Invariably Budai’s version is the very best. That goes for Budai’s Singapore Rice Noodles, which rank with those at May Cafe as the very best in the city. Singapore noodles are a tangle of thin rice vermicelli noodles stir-fried with pork, shrimp and vegetables (green and white onions, julienne carrots, cabbage, bean sprouts) in a light curry. The curry is terrific with more than a hint of piquancy coupling with a pungent quality while the clear vermicelli noodles are delightful, requiring no cutting or twirling around your fork. Both the pork (which is plentiful) and the shrimp are perfectly prepared. 31 October 2015: For years, American restaurants seemed to shun the long, narrow razor clam, an aversion likely triggered by the worm-like creature in the shell. Asian restaurants, meanwhile, showcased them in diverse and delicious ways. Resembling an old-fashioned straight razor, these mollusks may not be the most appealing in appearance, but their deliciousness outweighs any ill-founded prejudice. When Elsa is effusive about any menu item (as well she should be when her genius chef husband prepares it), you’ve got to try it. She raves about the stir-fried razor clams. So will you! A generous bowl of razor clams are served in a brown “gravy” with basil leaves, minced garlic, green onions and sheer magic. These magnificent mollusks are absolutely addictive, so good you’ll be tempted to order a second portion. 31 October 2015: If ever a dish earned its name, it’s Chow Fun, a stir-fried dish made with a broad rice noodle. For my Kim, few things are as much fun as showing me her adroitness with noodles, knowing anything longer than a rigatoni noodle confounds and endangers me (as in accidentally stabbing myself while trying to wrap the noodles around a fork). Chow Fun noodles can be longer than six-inches. In the hands of a stir-fried master, they can be quite wonderful. Budai prepares a version that includes chicken, onions, cabbage and chili. Though this dish has an oleaginous texture, Budai’s version is the antithesis of greasy and oily. That, too, evinces the chef’s deft touch and experience. This is the best chow fun dish in Albuquerque. 31 October 2015: What’s the best way to respond to the World Health Organization’s (WHO) denouncement of bacon as a cancer-causing scourge? If you’re tired of alarmist bureaucrats telling you what to do, you’ll thumb your nose and fry a rasher or two of bacon for your next breakfast. My way of showing rebellion was by ordering the pork belly bacon with spicy onion dish at Budai. Not even the hypocrites at the WHO would be able to resist this bounteous bowl of sheer deliciousness. The pork belly bacon combines the richness of pork belly with the smokiness of bacon, the best of two qualities. The onions inherit their spiciness from chili and jalapeños, stir-fried to a delightful consistency. Elsa suggested coupling this dish with rice, a good idea if you want the dish to go just a little further…or if you can’t handle the intense piquancy. 11 November 2012: Ask many people about Chinese desserts and the answers you’re likely to hear–almond cookies, fortune cookies, etc.–might induce laughter. In truth, many Chinese prefer fruits instead of the cloying, tooth-decaying sweets Americans crave. Leave it to Tsia to introduce us to something decadent, delicious and different–a lovely plating that resembles an orange noodle nest surrounding a patty of some sort. The “patty” is a roundish quarter-inch thick, maybe seven-inch around mound of sweet, sticky rice and raw peanuts caramelized to form a sort of pie. In fact, Elsa sliced it for us in the way we might slice pizza. This is an outstanding dessert which should be on the daily menu. That, too, is something which could be said about so many items at Budai, but then if you continuously repeat your favorites, you won’t experience the soon to be new favorites. 7 August 2016: In 2008, restaurateur extraordinaire Tom Hamilton invited us to dine at his fabulous restaurant, the Hamilton Chophouse then a tenant of the Glacier Club at Tamarron Resort’s Sundowner Lodge about twenty miles north of Durango. By the terminus of an exceptional meal, our high regard for the Chophouse was surpassed only by our esteem for its affable owner with whom we’ve remained friends. Tom Hamilton is an exemplar of class and integrity, one of the most devoted family men I’ve ever met. Though we’d seen him beam with pride when waxing poetic about Ellyn, the lovely love of his life and their delightful daughter Haley, we met them for the first time at Budai, one of Tom’s favorite restaurants in Albuquerque. Fortunately Elsa sat us at Budai’s most capacious table because the table’s Lazy Susan, roughly the size of a hot air balloon, was nearly overflowing with all the appetizers and entrees we shared and beautifully photographed by the talented Haley. 7 August 2016: Haley, it turns out, spent a summer studying in Taiwan where she developed a fondness for scallion pancakes. Budai’s version is reminiscent of those she enjoyed so much at the island nation formerly known as Formosa. At Budai, a scallion pancake is roughly the diameter of a personal-pizza. Scallion Pancakes are formed from hard dough rolled out in such a manner that it creates a series of layers similar to Greek phyllo without the flakiness and delicateness. In between those layers, a sheen of oil (or perhaps clarified butter) is applied and scallions are spread in between. 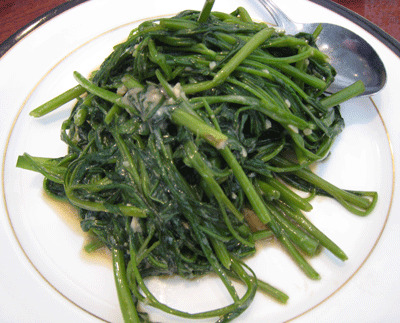 After the scallion pancake is rolled into a flat disc, it is fried in butter or oil until completely cooked and crisp on the outside. These golden orbs are superb! 7 August 2016: Bon Appetit describes soup dumplings (not pictured) as falling “in the category of “delicious things we love to order when we’re out, but would never even dream of making at home.” A mainstay of dim sum menus, these steamed buns are an intricate dish whose Houdini-like preparation baffles non-chefs. Within each plump dumpling is nestled a little pork meatball surrounded by a delightful meaty broth. How the broth gets in there is a mystery, the answer to which you can find online, but one foodies prefer not to contemplate as we’d rather be enjoying these tender pouches of porcine perfection with the liquid surprise. 7 August 2016: An episode of Friends in which Joey Tribbiani urinated on Monica’s jellyfish sting contributed to an inaccurate myth about jellyfish, the sting of which should be treated only with vinegar. Another myth is that jellyfish aren’t edible. Don’t ever tell Chef Hsia or anyone at our table that jellyfish aren’t edible. Not only that, they’re delicious…or at least the way they’re prepared at Budai whose Jellyfish Salad is magnificent. You’ll never give it a second thought that you’re eating jellyfish whose texture and flavor are palate pleasing as are the melange of ingredients (well-cooked jellyfish with celery, cilantro, rice cooking wine, white pepper powder and scallions) with which the jellyfish is prepared and served. Few dishes have surprised me as much as this one did. 7 August 2016: Regular readers have been subjected to my incessant whining about Americanized Chinese food and especially anything sweet and sour (typically described as “candied”). When Elsa recommended sweet and sour flounder we momentarily wondered if had forgotten who we are. She then explained that Shanghai style sweet and sour is very different and far superior. True enough. Instead of the cloying reddish sauce served at just about every other Chinese restaurant in town, Budai’s Shanghai style sweet and sour sauce is far more balanced with no one flavor component (sweet, savory, tangy, piquant) overwhelming the other. The flounder is delicate, flaky and absolutely delicious. 7 August 2016: As is often the case when ordering a number of dishes at Budai, you probably won’t achieve consensus in deciding which is the best or favorite. One dish came close. That would be the pork belly with bamboo. In this novel-length review you’ve already read about the Dong Bo Pork, the half-lean meat and half-fat pork belly dish with which I fell in love during my first visit to Budai. Picture smaller pieces of unctuous pork belly served in a rich, luxurious sauce with shredded bamboo (similar to the bamboo served with green curry at Thai restaurants). I was the sole hold-out who preferred the Dong Bo Pork whose combination of gelatinous fat and crispy bacon appeals to some primitive manly instinct. 7 August 2016: Though we rarely order from the regular menu, we’ll forever make an exception for the Black Pepper Lamb, a wok-fried dish with a piquant bite (courtesy of incendiary Thai bird peppers) served over crispy cellophane noodles. If you’ve ever lamented the gaminess of lamb, this is the lamb dish for diners who don’t like (or think they don’t like) lamb. The lamb is moist and glistening from the fiery influence of chili oils. Despite the heat, this is a very balanced dish with several tastes. Had it not been for the Shanghai-style sweet and sour flounder, this would have been my favorite dish. 7 August 2016: Thematically this review been a reflection on the pleasures of dining with friends peppered with my feeble attempts at describing dishes so good mere words don’t do them justice. Dining with the Hamiltons ranks up there with Friends of Gil outings for the sheer delectation of dining with great people who share a passion for wonderful food. In all likelihood, a Bemalmans style gourmet might not enjoy much about a meal at Budai, but most true foodies will. Budai is a very special restaurant, one which should be shared with open-minded friends who love food as much as you do. This had been my favorite Chinese restaurant in Abq. Until my dining partner found a piece of metal from a steel wool sponge in his Mongolian Beef. We told Elsa who basically did nothing except go back and yell at the chef. Seriously this could have ended in an emergency situation. We won’t be going back. Too bad it was great, but one bad experience ruined it for us. You are right, Gil; that was a tremendous feast only surpassed by the wonderful company of you and Kim! Having reread all your Budai posts it reminds me of so many other great meals we have enjoyed there. I need to get back and soon! I will arrange my future flights to originate in Albuquerque so I’ll have no excuse. Expect a call on my next break! Would a group of 70-80 yr olds, experienced diners all, enjoy? Place yourselves in Elsa’s capable hands and she’ll guide you through a great meal. Budai is a treasure! Went for dinner last night, a family tradition this time of year. Had reservations for seven at seven. They were very busy and understaffed, we were finally served at 8:05. Food was good but I would not wait that long again. The hot and sour is very good as we’re the pot stickers and the entrées. Better than most other Chinese restaurants in town. Alas! While “chili” for “chile” is most egregiously shameful Jim and Gil, apparently neither of you (possibly per age/availability) have the spectre of a Nun with a ruler, hanging around in your conscience! Elsewise, Y’all have apparently given in to the nouveau thing of excluding the Oxford comma. I.e., using the traditional comma being placed after “cabbage”! Shame, shame and more shame.” If I had written such a thing it would be OK.
My spellchecker yelled at me, too. It finds the spelling “chili” very offensive even though I’ve explained that “chile” can be found only in New Mexico and even then, it’s not used on every dish for some inexplicable reason. Sometimes restaurants use “chili” which they acquire from outside the Land of Enchantment. Chili is a broad term used to describe everything from the stuff mixed with carne in Texas to the incendiary ground bird peppers used in Asian cuisine. Who knows what that brown stuff is that Colorado calls chile. I miss Budai on a weekly basis. So. Good. Once again Budai satisfied my culinary need for excellent Chinese cuisine. We had the steamed pork buns and frankly there are no better bums on any menu anywhere I’ve ever dined. Period. e had Elsa’s recommended lamb dish, excellent. The lady knows her stuff, and knows her customers. An any greens they serve seem just better than anything else out there. We had hallow heart gently sautéed. My wife and I left very happy. By the way, Local Flavor used a full two (2) pages to reveal what those of us who appreciate Hsai’s expertise already know, Budai is the champion of fine Asian cuisine in Albuquerque. Consistency vs ” hit or miss”…………. I know that every visit will be as good as the last and that I need a consistent fix of steamed pork buns, egg foo young, Shanghai ribs, tofu in clay pot, cold noodles in sesame, sweet potato greens, dong Bo pork, a duck entree and anything Elsa suggests. Sat night was no different and no, we don’t order all those dishes. Elsa did mention that the elusive Yoda, aka Gil G. had dined there two nights prior. She said she had mentioned to Gil that a “commentor” (me) on his blog suggested the Shanghai ribs were worth a try but it seems Gil does real well without this commentor’s help. It’s actually the reverse, it is I who has benefited from his suggestions. I have had the pleasure of meeting Gil on a couple of occasions and the pleasure has been all mine. I am disappointed. Every time we eat at Budai I look around for someone who could be described as the bearded wonder so that I cam remind you to say something good about the place. Obviously we were both there yesterday but either you shaved or we were at different times. We took some friends for the first time in order to introduce them to what Chinese food was supposed to taste like and we split up the Lion’s Head and the crispy flounder. I had to order the Lion’s Head as we had set out to have it at Balou Jiulou in Shanghai and I found the Shanghai Metro system to be the only one in the entire world to completely baffle me, even after we got off. Unable to find it we went for the world’s second best at Budai. Ah yes, the bearded wonder. Perhaps that’s why some friends call me Quetzacoatl (the feathered serpent). Coincidentally I was hoping to run into you today at the Arirang Oriental Market where I was also hoping to glean some gems of knowledge about Korean food from you and the child bride. Now that Vivace has closed there’s one fewer restaurant we both frequent, but someday we’re bound to meet. And in the most amazing thing I have ever seen Tripadviser has Ko Palace rated as the best restaurant in Albuquerque . There are 108 reviews and only 21 were from before January 1, 2012 even though this perfectly ordinary place has been there for 20+ years. We had not been by in 10-15 years but stopped by even though the parking lot is always empty just to see what had changed. The only real change was fewer customers than there used to be. Why anybody (even a Brother in Law) would rate any Chinese restaurant in New Mexico above Budai is beyond me.